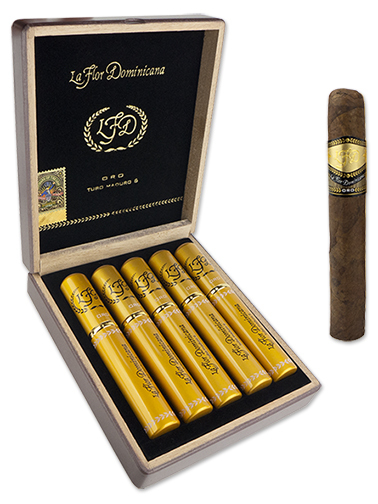 An homage to Litto Gomez's days in the jewelry business over 20 years ago, La Flor Dominicana Oro (meaning gold in Spanish) Natural and Maduro cigars are wrapped in cedar sleeves and encapsulated in elegant golden tubes. These premium handmade gems are blended with Dominican binder and fillers covered in a dark and delicious Nicaraguan Habano wrapper leaf from the top priming of Cuban-seed plants, with the Maduro's wrapper leaf undergoing an additional step to achieve its status. Whether you choose the Oro Natural or Maduro, you'll find the cigar's construction and burn to be impeccable. What may astonish you is that this full-bodied powerhouse is also complex and smooth with a rich profile that touches on virtually every spectrum of the flavor wheel.